Meguiars Flagship Premium Boat Wash is a blend of premium shampoo and conditioner that helps to enrich the fiberglass and gel coat of your boat, leaving it shining for days. Meguiars Flagship Premium Boat Wash is a blend of premium shampoo and conditioner that helps to enrich the fiberglass and gel coat of your boat, leaving it shining for days. The special conditioning agents will get your boat's finish so slick that the water will actually sheet right off. This helps to reduce your efforts and drying time. 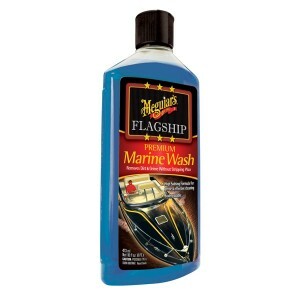 Best of all, Meguiars Flagship Premium Boat Wash is biodegradable and safe for the environment.